When we think about young, visionary horror filmmakers there’s a set of stereotypes that comes to mind. And while I may be presumptuous in stating so, these stereotypes NEVER include being a Lord, like say, the 21st Lord Dunsany. However, you’d all be well advised to throw your expectations out the window and proceed anew through Ravenous Monster’s chat with Ireland’s Randal Plunkett – a filmmaker from Meath whose family is not only one of the oldest and most prominent in the country, their genre storytelling roots go back generations. Plunkett is well connected and well versed in the arts, cinema in particular. Having studied film at Kingston University in London and later digital media and digital video at SAE in Amsterdam and again in London, he went on to form Dunsany Productions for which he’s the CEO. 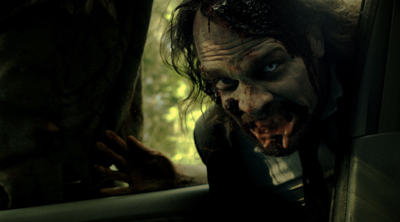 Plunkett appeared on Ravenous Monster’s menu by way of his latest short film, Out There – a synthesis of a couple different horror movie archetypes, most notably the zombie apocalypse. 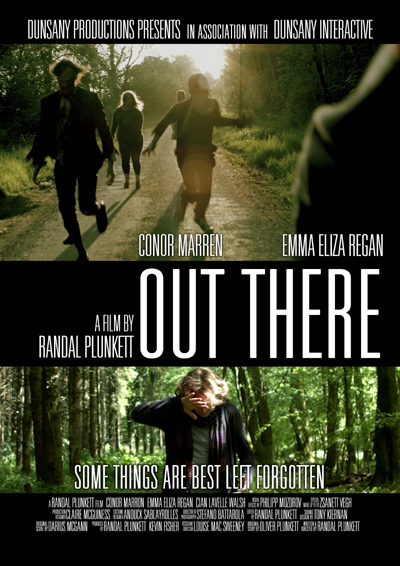 Out There stars Conor Marren as Robert, a young man who wakes up in the forest suffering from a bloody head wound and struggling to put the pieces together that explain his condition. As he attempts to find help, he stumbles upon an old farmhouse in which hides the macabre trophies of a madman, but no madman to be found. After he hastily retreats and continues looking for assistance, Robert’s memories come back in fits and starts and through flashbacks we begin to experience events from the days leading up to his painful awakening in the countryside. As Robert struggles to discover what’s happened to him, memories of his girlfriend Jane (Emma Eliza Regan) remind him that their relationship had just crumbled right before the event that left him wounded. With each new memory the situation grows more desperate and Robert’s anxiety becomes more consuming. As the hours slip by with no sign of Jane or anyone else, Robert soon discovers why – enter the zombies! Ravenous Monster caught up with Randal Plunkett – the 21st Lord Dunsany – to discuss Out There as well as genre movie making in Ireland and the legacy of horror films worldwide. Read on, Horror Fans…. RavMon: OUT THERE is as technically sound a short film as I’ve seen in recent years. Could you please describe your basic gear? Moreover, which rigs (crane jib, dolly, Steadicam) did you employ? Randal Plunkett: Well first off, I should mention that I am a very technical director. I have a good bit of experience as a cinematographer and as an editor. I pay a huge amount of attention in this area, even at the script stage. This understanding gives me a huge advantage when planning a production with my team. I was also lucky in that I had two very experienced cinematographers who agreed to work on the production – Italian director of photography, Stefano Battarola and a Russian cinematographer, Philip Morosov, who did all our Steadicam operation during the film. For Out There we knew that we were going to use a great deal of tracking, so we needed to pick the right tools to cater for our needs. Having a Steadicam tracking our star Conor Marren in the woods mid-summer was bound to create certain issues with the camera’s ability to handle the large amounts of details on screen, as well as coping with movement. It was clear when we mapped out our original shot list, that we would require a heavy-duty camera. This camera had to be able to shoot large format for us to have a filmic look in the woods and not make everything fuzzy, which lower format cameras would do under the strain. 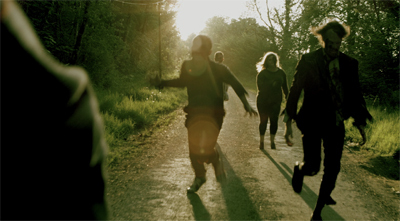 Morosov had just come off the shoot for the latest Lost Prophets video, which they had shot using the Red Scarlet; Red’s newest cinema camera. I had been waiting a long time to try this camera and this would be the greatest test for its abilities. Unfortunately due to the high cost of renting high-end cameras in Ireland, I knew I would not be able to go crazy with lenses, so we used Canon EF luxury zoom lenses, which Morosov owned himself. We were very lucky to receive a great deal of support from Collin Browne; owner of Film Equipment Hire, which is the best place in the country for indie film makers to get high quality gear on a modest budget. Browne, who I have known since he first opened, gave us a fantastic deal on our equipment. We even got a chance to check out his awesome jib crane by Miller. You can see its handy work during the garden scenes. It was crucial to giving us that dynamic movement through the branches. Arri blondes and Dido lights were also used to give the farmhouse that creepy look. RavMon: It seems as though you include subtle nods to THE TEXAS CHAINSAW MASSACRE as well as the 28 DAYS/WEEKS LATER films. Is this accurate? RP: That would be very accurate! Both those films heavily influenced me through out my career. The thing which made both those films key pieces of cinema, were how they dealt with the build up of tension and atmosphere. One thing I know I wanted to create in this film was the feelings I had when I watched those films the first time. The Texas Chainsaw Massacre had that iconic house. In Out There I wanted to throw the audience a curve ball. I wanted to trick them into thinking the film was going to use the chase movie cliché, which horror fans are so used to. I knew once an audience would see severed pigs heads and all the crazy stuff we had in that house; it would be easy to hit them with the surprise of zombies. Everyone would be mentally prepared for a madman wielding an axe or a chainsaw, but that is merely my trick to lure the audience into that false sense of security. The ironic thing in my film is that the house has nothing to do with the story at all. Its just there to lure the audience into a false sense of expectation. 28 Days Later also had something which really caught my interest the first time I saw it and that was how well it was brought up to before the introduction of the zombies. 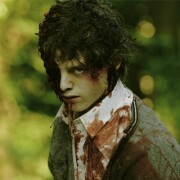 The best part of that film for me was not the zombies, but him wondering around the empty streets and hospital. That’s what I wanted in Out There; I wanted to show massive empty countryside, with not a soul in sight. The problem I had was if I didn’t change it up a bit, the audience may see the reference too early and the surprise would have been lost. That’s why the curve ball in the form of the house was so necessary. RavMon: Which films inspire your work in general? RP: I have a vast amount of influences; from French New Wave cinema to ‘80s Grindhouse. I was very lucky when I was young to have had such variety of cinema around me growing up. I was brought up on a steady diet of European art films and classic Hollywood. As I got older, I became very influenced by the greats such Bunuel, Hitchcock, Scorsese and Ray. One of the big influences for me and ultimately had led me into being interested in horror was the great Roman Polanski. Films like The Tenant, Rosemary’s Baby and Repulsion, changed my life. When I saw those films, I knew they were the kind of films I wanted to make. They were subtle and creepy and full of macabre undertones. I was always very interested in the idea of leaving a lot open to interpretation. When I make films, I try and provoke thoughts and imagination in my audience, the same way these films did to me. Another great artist who influenced me a lot was the great Dario Argento. His influence in my work, I believe is very prominent. This is particularly so in visual style. I’m fascinated by color schemes and visual tones in cinema. I think one of the best films to illustrate this influence would be his film Susperia. Susperia uses an unnatural over the top use of colors, which I became passionate about. It was a popular choice over the last three decades in the low budget horror. I think this style of pushing the colors to the extreme is a wonderful visual tool to help with the creation of escapism and that is why I used it very prominently on my second film Prey. RavMon: Do you consider yourself a horror filmmaker? RP: I prefer not to limit myself to just being a horror director. I have in the past directed things that were not horror, like my first film Kiss Kiss, which was more of a thriller. Horror for me at the moment does come a lot easier. This probably because we are living in dark times and life is difficult for young people at the moment. I have had to endure a great deal of loss and personal struggle over the last few years and I think my films reflect that. I am part of the generation who felt the curl of the wave as water breaks. Sadly now there is only a watermark of where life used to be. And this is why horror is the most interesting genre for me at the moment. I can express myself and my feelings by transforming my fears and insecurities into physical monsters and dangers. Being a huge horror fan myself, I understand the excitement that Horror fans get when the fear and tension are built up in a movie. My mind is a very dark place and that is why I feel I have a lot to offer the genre. But it’s more than that, I believe it’s genetic also. Horror runs in my family; my great grandfather was a famous fantasy writer who spent most of his time working on the macabre. RavMon: That’s fascinating. Do we know his work? What’s his name? RP: His name is Edward John Moreton Drax Plunkett, he was the 18th Baron of Dunsany. He is known more by his published name, Lord Dunsany. He is widely regarded as one of the pioneers of fantasy. He was very influential among his fantasy peers. Some of these include Tolkien, Yates, Ledwidge, and Lovecraft. More than eighty books of his work were published, and his oeuvre includes many hundreds of published short stories, as well as successful plays, novels, and essays. Some of his more famous titles would include The King of Elflands Daughter, The Gods of Pegana, The Book of Wonder and The Sword of Welleran. In more recent years, there has even been a film adaption of one of his stories; this story is called Dean Spanley, it stars Peter O’Toole, Jeremy Northam and Sam Neill. It is really a wonderful film and I highly recommend it. RavMon: Which stories, regardless of medium, led the young Randal Plunkett down the perilous path toward film making? RP: Well I was a very impressionable kid growing up, and my father and mother were highly educated and cultured. So there was a great deal of cinema and literature in my house growing up. I was always fascinated by stories of personal struggle, especially in vast emptiness and solitude. My dad was my idol and used to read to me when I was young, which really helped develop my imagination. This form of story telling I think was a major influence in my career. One of my favorite stories he used to read was Robinson Crusoe by Daniel Dafoe. I was fascinated by the central character’s psychological state from being lost on this island, living a life of solitude; knowing that his friends and family would never know what happened to him. It is this emotion, which I felt I could really understand. This was one of the foundational books for me; even today all my films deal with isolation and solitude. I think my early exposure to this has a lot to do with it. Another story, which had a big influence on me as a young child, was Albert Lamorisse’s short film Le Ballon Rouge. This was my favorite film for years. I used to rent it every weekend with my dad. It was a tragic story about a young boy who is alone; He has no friends and his parents are absent. One day on the way to school he finds the most beautiful red balloon that becomes his friend. The boy humanizes the object of the balloon and they build a relationship. Later in the film, the balloon is destroyed by horrible kids, who throw stones at it. When it bursts, the film becomes a tragedy. This film caused me more anguish than my whole teenage years put together. Finally one of the other stories that were very impressionable to me was the story of Dracula. My father read this to me when I was a kid as well. I think however, I liked it for a lot of other reasons than some of my peers. I always had a sort of sympathy for Dracula; I felt that Dracula’s passion for his long lost love and the hatred for a god who could have caused him so much hurt by taking her away always rang a rather tragic note for me. I felt the concept of him drinking blood, even at my young age was a form of torture from god on him. Animals in nature that are seen to get life from sucking it out of others are always looked upon as the lowest form of animal life. Take the leech; it is looked upon as a filthy dirty disease-carrying creature. The great Vlad Dracula aka Vlad the Impaler, who essentially was a hero to his people; as he defended Romania from the invading Turks…like the devil Lucifer, he was cast down into the lowest form of being, cursed forever to be tortured by time, with only loss to keep him company. It was fascinating to me how his hatred deformed him into the creatures we now see in so many film adaptations. RavMon: What’s the horror scene like in Ireland? RP: I feel that the horror scene in Ireland has for many years been quiet with very few films having any real impact, but I think that is about to change. This year so far, there have been two rather sizable films, which have done extremely well in the horror genre. These are Conor McMahon’s horror comedy Stitches and Ciaran Foy’s Citadel. Both filmmakers are putting Ireland on the horror map. We have so much creditability in horror literature but there hasn’t really been the same for horror cinema. But thanks to directors like these and a very supportive Irish film board, which in the last few years has become open and supportive to new alternative projects, we are seeing in my belief, a golden age for the genre here in Ireland. RavMon: With regard to indie film making, do you need to obtain permits or overcome other similar legal hurdles to film there like we do in the U.S.? RP: I can’t really comment too much on the differences between Ireland and America in regards to permits, simply because I have not had to deal with film making in the U.S. yet. But in Ireland, there is a lot of red tape to get through. Ireland as a whole, and particularly in my neck of the woods, gets a huge amount of support for our projects from the local councils. In my dealings with them in the past, they are usually extremely happy to see creative opportunity for local people. They always laugh when they hear what I m cooking up. When I told them zombies would be running up and down the road, the council asked me if they could also come and be zombies. That’s a good indicator of how people are in regards to filmmakers. There is a great deal of support for the arts in general. So we are very lucky. But my particular situation is different; I rarely need to ask permission for anything. I generally shoot all my films on my own estate in Dunsany. In fact the whole of Out There was shot on the grounds of the Dunsany estate, or as I like to regularly call it these days, ‘Dunsanywood’. RavMon: Your principal cast, Conor Marren and Emma Eliza Regan, are very good. What was your casting process and what’s your approach toward directing performers/performances? RP: Well I’m lucky in the fact that I know what I like and I know what I want. When I write a script, I expect it to change and develop right ‘till the day we start shooting. To get this refinement of the script and the development of the characters, I need to find actors who can take what I wrote, understand the subtext and add to it, but at the same time, keeping true to the meaning behind the words. So when I had met Conor Marren I knew after one meeting that he had the understanding and the passion to be able to deliver what I had in mind. I had the same thing with Emma Eliza Regan, who is quickly becoming one of the hottest young actors in Ireland. With these two in a room, we had to deconstruct the script, tear it to pieces and together we had to reinvent it. This is not the way every one works, but it’s the way I work and I needed two extremely like-minded artists to help me paint my picture. When you develop this creative relationship with actors that are able to venture that deep into the characters they are portraying, it allows the truth in the performance to come to the surface. When you have that, there is little direction needed. The rest is just the technical performance, which is done on the day with the cinematographer present. RavMon: OUT THERE uses flashbacks to drip out exposition throughout its 16-minute running time, eventually wrapping around full circle to the film’s final shot. In most cases, a heavy reliance on narrative devices such as flashbacks is taboo; however, you use them successfully here. What was your thinking with regard to maintaining forward momentum while showing us Robert and Jane’s distant and recent pasts so often? RP: Unlike a lot of my previous films, which were far more dialogue heavy, Out There was the first time in which myself and my cast literary ripped out all the dialogue of the script! To be honest though, even in the original version there wasn’t much. But we were interested to tell the story of Rob’s journey in as few words as possible. The problem is when you don’t tell people what’s happening; it is important to keep their interests in the characters. The flashbacks in this film were there to give an insight into their relationships. But most importantly, they had to show the change, not only in their physical situation but to also to illustrate the gradual erosion of their relationship. So at first, you see all is well and fun, in a magical setting of the garden. Rob and Jane’s characters are joyful and carefree. The next flashback is the fear of responsibility, which takes place in that very awkward scene in the bathroom; in which Jane reveals she is pregnant. The car scene is the momentary possibility of change and growth; it’s the possibility of salvation. The final flashback aims to show that there is no salvation and the moment there is a possibility of hope, it is shattered in a thousand pieces. I don’t think I could have effectively conveyed this to an audience without this obvious use of flashbacks, which is perhaps overdone in a lot of modern cinema but I think in this case it can be justified. RavMon: OUT THERE is a zombie story, but since you’ve included other horrific elements happening in the foreboding, isolated countryside like the creepy house, are there plans to expand this tale into a feature film and flesh out more of the story? RP: Yes, this film was always a piece of a bigger story. The feature version of the story is in pre-production now. It’s being currently produced by me and my brother who is taking a hands-on role with the writing of it. The film will take place six months later, in the dead of winter. 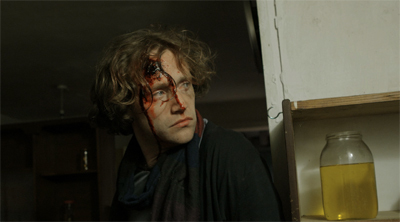 Rob’s character is living alone in an old abandoned cottage in the countryside, scavenging the bleak wilderness for food. He is alone and always hiding trying not to run into zombies. We are aiming to make it very different from Out There by incorporating plenty of action and adventure as Rob fights to survive a very difficult post apocalyptic world. We expect it to be ready by this time next year. RavMon: Will this include expanding the creepy house part of the story? RP: In the original story that I had drafted, the house was to play a big part in the feature film. But since then, the story has been completely transformed. I felt that perhaps the house was too much. But 90% of the horror fans I have spoken to who have seen the film wanted more of the horror house! When you have fans demanding more horror house, what is a writer to do? Well I’ll tell you, I’m going to listen to what the public wants. So my original idea of the house is going to be reincorporated into the new storyline. So expect Rob’s character to uncover what is going on in there and who it is that inhabits it. Stay tuned. RavMon: You appear to be in the fast-zombie camp. A lot of horror purists seem to frown upon the depiction of relatively athletically-endowed corpses. But practically speaking, they are scary. What’s your take on the matter and what would you tell the naysayers out there to convince them to jump on the fast-zombie bandwagon? RP: Well first off, I would never try and convince a horror purest of anything. RavMon: I suppose that could be perilous…. RP: What I will say is that I am a big lover of possibilities! The walking dead zombies are fantastic, and bring a certain kind of fear and tension to a film. The running zombies are more animalistic and give us the sense of a predator-like adversary. It is not clear in Out There whether the zombies are dead or living, it never gives us that information. I think personally in my case, I wanted an aggressive monster, like that of a werewolf or a mutant. The danger on screen had to posses an instant ferocity. And to have that kind of humanoid monster, I needed them to be dangerous and powerful, even in small numbers. So running zombies were my pick! 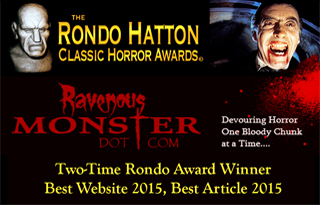 RavMon: Where can horror fans see OUT THERE? RP: At the moment the film is being sent to festivals for 2013, and as yet we have no dates confirmed. But if your readers are interested to see more, I suggest they like the Facebook page which is regularly updated with all the news. RavMon: What’s next for Dunsany Productions? RP: Well, Dunsany Productions has two projects on the go at the moment. One, of course, is the feature version of Out There, which is still currently untitled. The other is a gothic fairy tale horror film that myself and Out There’s lead actress Emma Eliza Regan are working on called The Tower, which we also hope to be in production in 2013.